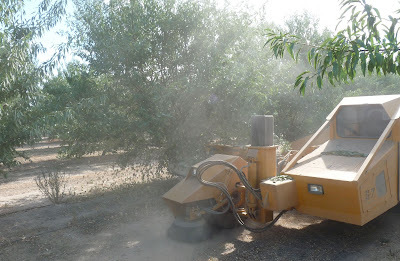 Almond harvest should start in earnest in Kern County, most likely next week, given the 100-degree temperatures everywhere. This is very early for this year's crop size. “This is the worst mite year that we've ever had--across the whole county,” Crawford noted. “The reason for the high pressure is not exactly clear,” he said. “Many Kern County farmers are now extracting water at the bottom of their wells and will need to spend $250,000 each to go deeper. Those big deep wells on the West Side with 200 HP pumps are sucking the water from the East Side,” he said. Crawford warned that the groundwater will not last long. “We are going to barely make it through this season with 30 percent allocations. And next season, if we do not get enough water for the vast orchards on the west side of Kern County, on beautiful ground and with every irrigation economy available, particularly drip, growers will go into survival mode,” said Crawford. Growers will shake their trees at bloom to eliminate the crop and then give the tree a few sips of water so that that it doesn’t die. Hopefully that will get them to another good winter of rain. But still, it will take the trees two full years to recover. “And it’s amazing that nearly all of these water problems are due to the Delta Smelt,” Crawford said.